Extend and customize your solution using REST API and open-source interfaces. Portal easily integrates with mainstream third-party tools and infrastructure. Portal flexibly ingests all types of digital media, both motion and static. Transcode full range of media formats or integrate with third-party transcoders. Leverage virtually unlimited user-defined metadata fields. Automatically manage content and handle access rights with sophisticated rules. Employ enterprise-resilient storage (five-9s reliability) for peace of mind. Choose from the entire NetApp® scale-out NAS storage portfolio to architect the optimum workgroup infrastructure. Enjoy rapid response with worldwide parts depots and customer support. Implement RAID 6 (or NetApp RAID DP® technology) or Dynamic Disk Pools for unhindered operations during disk rebuilds. Video has become an important communication channel that goes well beyond entertainment. Increasingly, companies use video not only to entertain, but to inform and engage their customers and their employees. As a result, these companies generate vast numbers of media assets. Given the proliferation of content sources, video formats, and delivery platforms, plus the sheer size of HD and 4K video files, media libraries are full to bursting. Finding the right piece of content at the right time is not always easy. Furthermore, enterprise content producers must be able to access, manage, share, edit, review, and archive that content easily and immediately. The problem calls for a media asset management system (MAM) that lets users locate, manage, and share content across workgroups. The system must also provide high- performance storage at uncompressed bandwidth for unfettered access to all video formats and resolutions. The MAM must be simple, intuitive, and lightweight. With Cantemo Portal, enterprises can easily maintain control over all of their media content. Indexing and searching are easy, as is establishing rules to ensure that the system performs the right actions in the right way at the right time. That capability includes sending an asset for review, archiving it, or distributing it across multiple platforms. But Cantemo Portal’s real strength lies in its open-ended, modularized framework that anyone can use to add integrations and extensions, meaning that customers can build the perfect solution for their needs. On the back end, NetApp FAS storage running the NetApp Data ONTAP® storage operating system provides a centralized, shared content repository. Enterprise users get reliable, low-latency, concurrent access to their media content so that everyone on the creative team can ingest, edit, render, and transcode the content in real time. With the latest generation of FAS controllers, hybrid flash architectures, and 10 Gigabit Ethernet interfaces, there is plenty of video throughput for these video workgroups using enterprise scale-out NAS from NetApp. The combination of Cantemo Portal and NetApp storage solutions results in a versatile, corporate-friendly MAM. 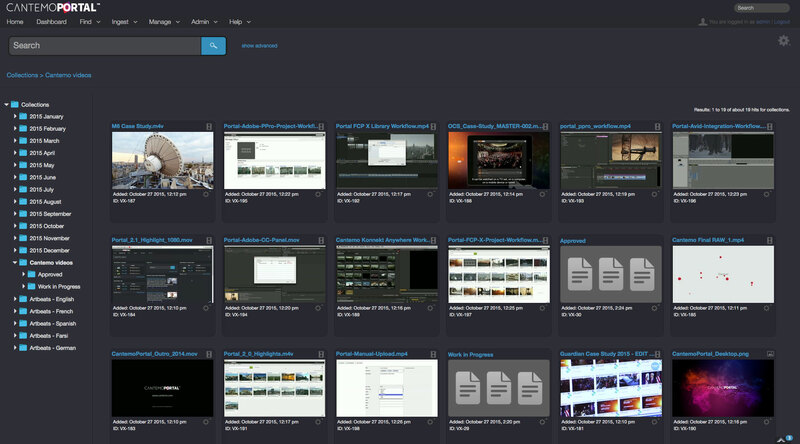 This system enables enterprise video producers to easily manage, search, edit, review, distribute, and archive their content instantly, all from one place. NetApp can leverage its wide portfolio of enterprise class storage platforms to enable corporate video departments to architect more ef cient and supportable media production and distribution work ows. The entire storage portfolio allows NetApp to optimize for application performance, bandwidth, capacity, and enterprise features. Extreme customizability and extensibility, themed interface, and modular applications. The platform also supports a long list of video containers, audio formats, images (bitmap and vector), and documents.